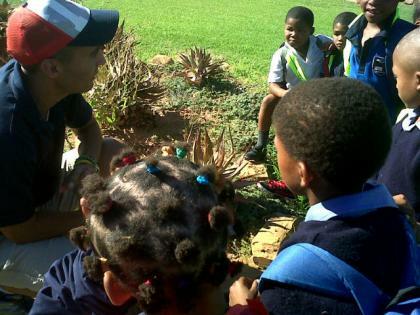 At Karoo Desert NBG we offer Garden-based schools programmes to schools and other guided lessons to youth and community groups. It offers hands-on, interactive learning programmes to schools, based on the Curriculum Assessment and Policy Statement (CAPS). Learners can have fun learning in an interesting semi-desert natural environment. They can discover the rich diversity in succulents and how hardy these indigenous plants need to be in order to survive often harsh conditions. They can see interesting plants like the tiny ‘stone plants’ or lithops. Special lessons are facilitated in celebration of the Environmental Days and Weeks. Decide well in advance when a visit to the Garden is going to be most beneficial to your learners. Contact Eunice Jurgens to book your visit. Fill in and return the booking form, indicating your choice of topic. To confirm this booking, the full amount should be deposited into the SANBI bank account seven days after we have received the booking information (see booking form for account number). Cheques should be made out to the South African National Biodiversity Institute. Please ensure that there is at least one educator available to supervise every 20-25 learners. Educators are expected to be with the group for the duration of the learning programme. In hot weather, learners must carry a bottle of water. Learners should bring their own lunch as there is no tuck-shop to buy snacks or drinks. Please arrive in good time for the start of your lesson.